Mornese (Italia). 'Mornese you are a dream' has been realised for the 33 participants of Project Mornese 2019 from the four continents of Asia, Africa, America and Oceania. 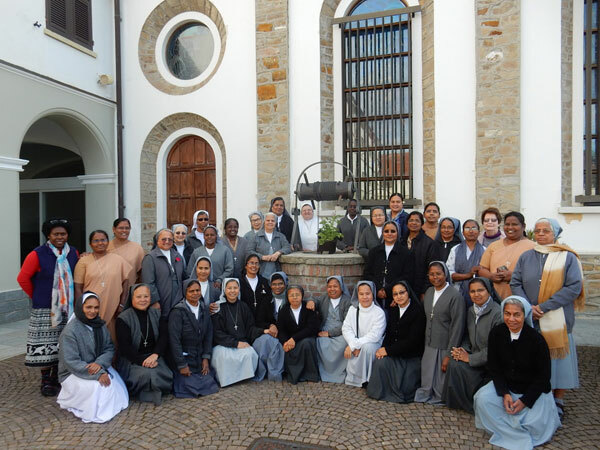 The programme commenced on 18 February and concluded on 17 March 2019 coordinated by Sr. Carmen Figueroa, and facilitated by Sr. Edna Mary MacDonald, Sr. Supriya Noronha and Sr. Teresa Jojo. 3. Returning to the home of our heart in Mornese. 'It was inspiring and enriching to go back to the origins of our charism where our founder and co-foundress lived and worked to give life to the others'. 'I am renewed and re- energised in my religious life as an FMA and wish other Sisters too to experience the same'. Yet another added, 'For me, Mornese Project was an experience of going to the source of our charism, making Don Bosco and Mother Mazzarello alive in our present time. It made me go deeper in my life as religious, my commitment and my mission'. Everyone felt enthused with the inner desire to be better FMAs and help others to be so, despite differences. Our Family Spirit was lived and shared among the participants. Punctuality for various moments was remarkable as commented by the facilitators. The entire programme was well coordinated with much creativity and newness each day. The one-month pilgrimage can be described as an intense experience of journeying together to drink from the wellspring of our charism. The Sisters attested that praying together, working together, sharing together, and caring for each other have indeed re-kindled the fire of Mornese in their lives. Enlightened and burning with love and zeal, the participants are happy to return to their provinces, be missionaries of joy, and hope in their communities and mission. The group is indebted to God through the Institute for such initiative undertaken and to our provinces for the opportunity give for such an experiential pilgrimage. We are grateful to the communities of Rome, Turin, Nizza and Mornese for being part of our pilgrim journey. Our sincere appreciation to the Sisters and many other persons who helped us to be spiritually enriched and physically re-energised. Sr. Carmen Figueroa, the coordinator for all Project Mornese experiences, and the facilitators have inspired and enriched the group with their thorough knowledge of the charism and with their very lives. A note of thanks to Fr. Jeyaseelan SDB, Chaplain of PM 2019 for inspiring us with his well-prepared homilies and his brotherly presence. All the participants resolved to be another Mazzarello no matter the struggles and challenges that each FMA has to continue to face. Truly, we are grateful to God for the gift of our FMA vocation.